Up a tree. 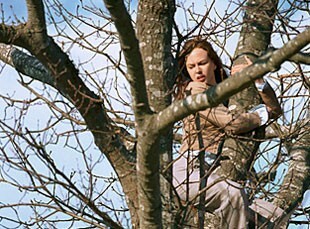 In Noah Baumbach's Margot at the Wedding, Nicole Kidman's character gets stuck in an old red oak overlooking her family's Long Island seaside property. The symbolism's patent, the character's anxiety palpable—yet considerably more emerges from the physical world itself, in the comfortable pulpy textures of the trunk, the spread of the branches, the beckoning oceanic view: equal parts terror and transport, intimacy and infinity, with a radiant blue envelope of sky and water that seems to go on forever. Something like bliss on a crisp fall day, out on the scary subliminal edge of feeling—except you have to go beyond the literal script to find it. Also another peak moment in the foliage: the mist-shrouded finale of Sharon Lockhart's structuralist, meditative Pine Flat. Is there an actual tree in that billowing murk or only the ghost of same? With so much ambiguous hide-and-seek to puzzle over, it's almost impossible to know. Trouble in the casbah. Don't you just love the way Julia Stiles's hair swings in one direction as the rest of her goes another during the big "woman in distress" chase sequence in The Bourne Ultimatum? Almost anonymous as she ping-pongs down assorted Tunisian alleyways and corridors, except every so often she'll turn to face the camera full—just so you know it's her, I guess. Almost pure formal abstraction in a film that would rather do away with actors and characters altogether—as well as, arguably, the most interesting thing about it. Obviously there's more but unfortunately I haven't the time ... so why not fill in the blanks with some examples of your own?